When you quiet the mind, even for a moment, it can bring balance, peace and clarity to a person. Complete silence, concentrating on a single object or focal point is one example of a meditative posture, listening to calming music while sitting with your eyes closed is another. Some people meditate while their body is active in a repetitive motion, thus freeing the mind to a place of deep thought or serenity. Regardless of the technique, meditation is an important part of a daily routine to maintain physical and spiritual balance, staying present within one’s self, and aware of the spiritual nature of our being. Meditation is a relaxing state of mind and being. 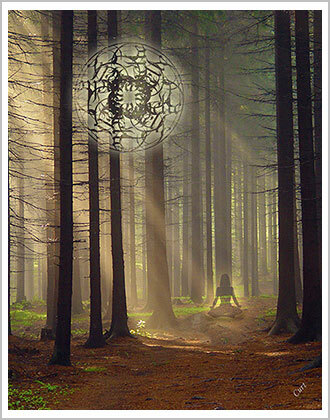 When I begin a meditation class or session I always ask for protection and assistance from those in spirit world. Followed by deep breaths to relax the physical body and assist in clearing the mind; if you have trouble with this step, try concentrating on the air breathed in, follow it in through the nose, down the wind pipe, filling the lungs, then released from the lungs, back up the wind pipe, and out through the mouth. Feel the sensation of the air and think about the importance this step to your physical body. Some people actually clear their mind by asking themselves, “am I breathing” and then doing the above step. Once the mind and body are relaxed follow your feelings about the proper technique for you. There is no set amount of time required to meditate, it can be as short as a few minutes or hours long. When you finish meditating remember to show appreciation for all you have been able to experience, even when you don’t consciously think you experienced anything at all.